Les Deakins sont un excellent groupe australien de Beat music. Ils sont trois: Ian Kincade, Jeff Donahue et Bob Miller, ils sont jeunes et viennent de Melbourne. En 1966, ils signent deux excellents single pour la firme Go!. Pourtant, ils sont les auteurs d'une beat efficace, dansante dans un style proche des Fab Four qui mériterait d'être plus connu, notamment l'excellent Look & Learn, une tube! The Deakins are a fantastic aussie 60s beat band. The official line up was: Ian Kincade, Jeff Donahue and Bob Miller, they were comming from Melbourne. 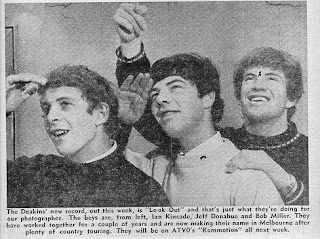 In '66, they recorded 2 great singles for the Go! label. We don't know much things about them. Almost nothing, their records are really hard to find, we just could find them on compilations like the second volum of the Worldbeater or the Go Going Gone comp. Nevertheless, They made some great catchy dance beat, a bit like The Fab Four. They really should be better known, because as you can heard it, Look & Learn is an instant anthem! close your eyes and listen to oh listen! Together, you gotta look and learn! Together, you gotta look, gotta look gotta look and learn! Could you please repost this track? I am Australian and would love to get a copy to listen to!